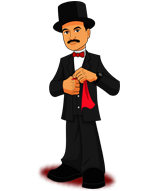 Today, when you order "Shrinking Cigarette by Uday", you'll instantly be emailed a Penguin Magic gift certificate. You can spend it on anything you like at Penguin, just like cash. Just complete your order as normal, and within seconds you'll get an email with your gift certificate. Order in the next 7 hours 26 minutes and it will ship TODAY! I've done this very often. This effect is great! It makes people laugh! I've got some nice lines that I found to say while I perform this piece. Drop the miniature cigarette in the spectator's hand for maximal impact. For the price it is a good deal. I lost my mini cigarette and bought this product once again to perform it some more! The only downside I see is that the golden cap doesn't stay on the tube so it slides around where I keep it... which caused me to loose the mini-cigarette on my first kit. I love this! Worth ten times the price. I use it at work telling my employees that the big boss wants to cut down the time on cigarette breaks so he has come up with a idea to cut a inch off their cigarettes (I show them the gimmick cigarette, its about a inch shorter then a real cigarette) and say I have a sample but that I have a better idea. (I took a real NICODERM patch, using just the cover foil, I put the patch on it, cut it to size, rolled it up, printing out and taped it). I do the routine and when they open the tube a real NICODERM patch comes out. Like I said, I love this and they can't smoke with their jaws dropped open. 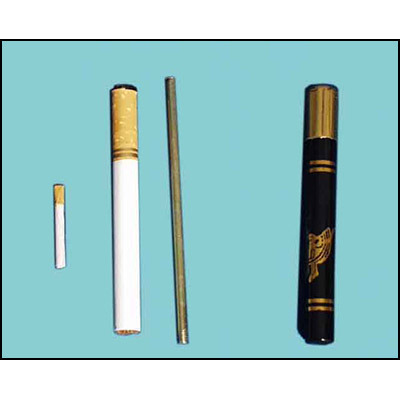 The gimmick supplied to remove the cig is no longer metal (as pictured) but a thicker plastic rod that removes the cig in a different way. IMO the best way to perform this is to make the cig disappear entirely, or to change it into mini M&Ms or some other candy. Don't leave them with the impression that cigarettes are "cute". Easy to do! Super fun, great reactions!